A poll released Wednesday from Morning Consult found that many Americans are in favour of banning immigration from certain parts of the world — even from countries bordering the US. Donald Trump injected a strong anti-immigration sentiment into the political conversation. More recently, he’s reintroduced his proposal for an indefinite ban on Muslim immigration into the country — a suggestion widely condemned by elected Republicans. However, despite being fiercely rejected by elected Republican leaders, nearly half of Republicans polled by Morning Consult said they “strongly” support such a ban, while 48% of all Americans said they support a ban on Muslim immigration. 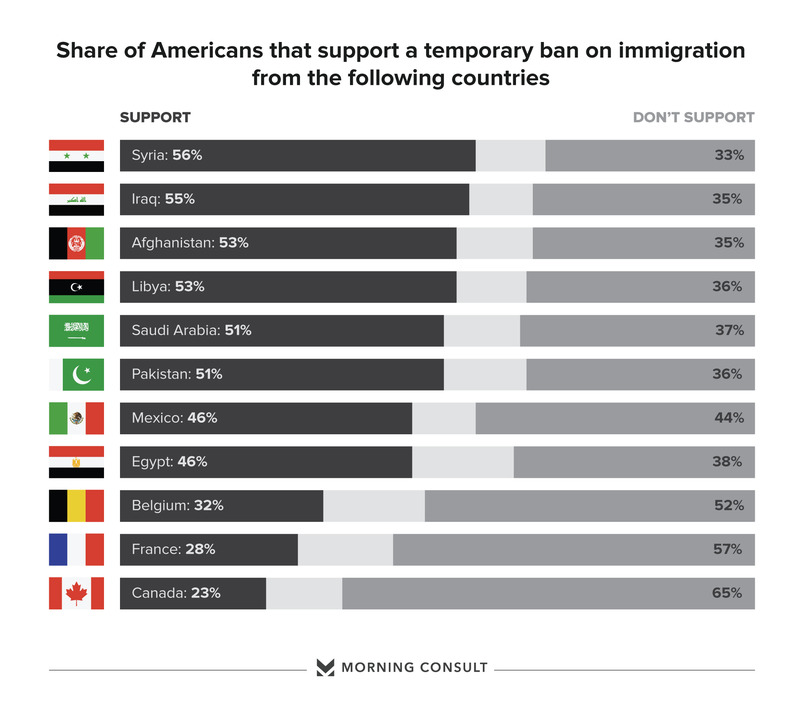 Morning Consult asked respondents whether they support an overall ban on immigration from 11 countries: Syria, Iraq, Afghanistan, Libya, Saudi Arabia, Pakistan, Mexico, Egypt, Belgium, France, and Canada. Syria had the greatest support among respondents in favour of an immigration ban with 56% saying they supported it. Iraq, Afghanistan, Libya, Saudi Arabia, and Pakistan all followed close behind, each breaking 51% support. Nearly half of respondents, 46%, favoured a ban on all immigration from Mexico, a country Trump has zeroed in on throughout his campaign. 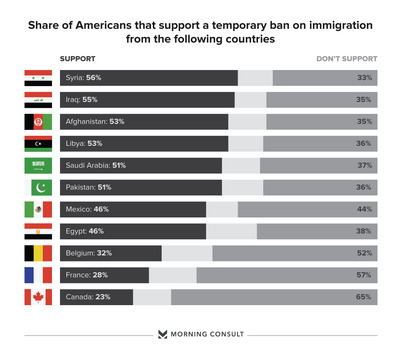 Belgium, France, and even Canada all received significant support for a total immigration ban. Roughly 30% of respondents were in favour of a ban on all immigration from Belgium and France, the sites of two of the worst terror attacks in the past year, while almost one-quarter of respondents were for banning Canadian immigration into America. The Morning Consult poll surveyed 2,001 voters and had a margin of error of 2%.